Oh, so similar under the skin? THE conspiracy theory is a great thing, don’t you think? Usually conjured up by fertile imaginations, conspiracy theories are used to explain away conventional wisdoms, and in doing so, challenge what we hold close to our hearts as solid facts. 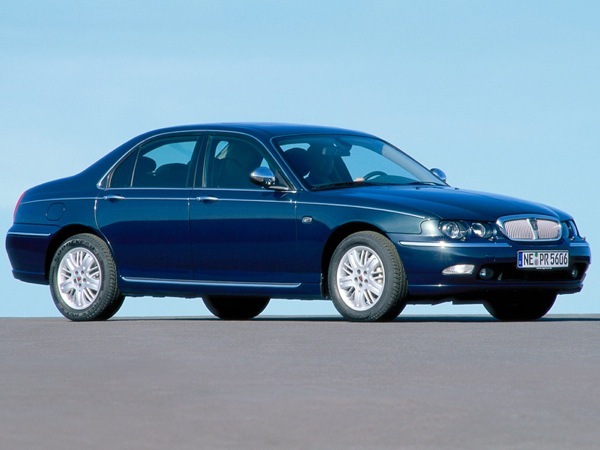 Take for instance, the Rover 75 – for years after it was launched, commentators would gleefully tell us that it was based on an existing BMW platform, even though conventional wisdom told us otherwise. I mean, who would you trust to build a great front wheel drive car – the people who came up with the Mini in 1959, or BMW? Precisely. The same is happening again with the BMW 1 Series and the ill-fated Rover R30… they’re related, right? Well, possibily. Maybe. Who really knows? Well, we know who knows, but they aren’t talking right now, because the whole thing is still too recent. But these are no precedents. There are other conspiracy theories in BMC>Rover’s history, many of which, we have yet to get to the bottom of, even after all these years. 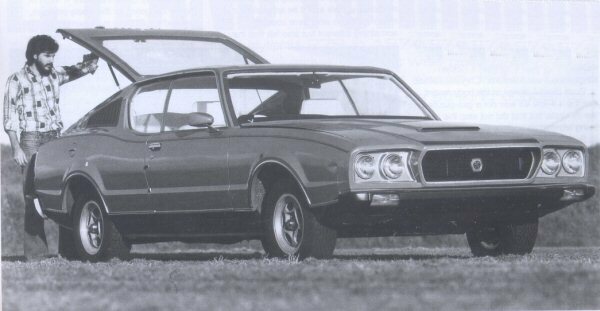 Take for instance the Leyland-Australia P76 – here’s a car, seemingly conjured out of nowhere, tailored specifically for the Australian market that owed nothing to any other model in BL’s elephantine model catalogue. And when one thinks that BLMC was moving towards more rational cost management at the time, under the leadership of George Turnbull and John Barber, it seems odd that the company would launch a brand new car with no carry over parts. Except that this is not quite true. For one, the P76 did pick up the a development of the well-respected E6-Series engine, which at the time lived under the bonnet of the Wolseley Six and Austin Kimberley. Okay, it was a version not yet seen in the BL product range (unlike the 2.2-litre E6-Series engine), and displaced 2623cc, but it was still a parts bin special as its relationship to the 2.2-litre E6 was the same as the 1750cc E4-Series was related to the 1485cc version. The other P76 engine was a magnificent 4.4-litre version of the Rover V8. Initially earmarked for the Rover P8 project, this engine was a logical upscaling of the original, and most befitting of a new and bold leader of the Rover range. Sadly, the P8 was killed at the eleventh hour of its development cycle, when it became clear that it had no real advantages over the long wheelbase versions of the Jaguar XJ6, and would serve no other purpose than to be an internal competitor to the Browns Lane product. Well, that was Sir William Lyons’ view anyway – and as he was a BL board member at the time of the P8’s culling, his view was a very important one. As can be read in the Rover P8 development story, its gestation progressed right through to the pre-production stage – even as far as having its body pressings made up by Pressed Steel in anticipation of a full production run. This would have been a very expensive process, and one that would have been very painful for the company not to see through to its conclusion. But die it did, and in Spring 1971, the entered the realms of a BMC>Rover fascinating might-have-been. But would all of that development simply gone to waste? That is the main question. It’s a hatchback, and an unusually large one at that. 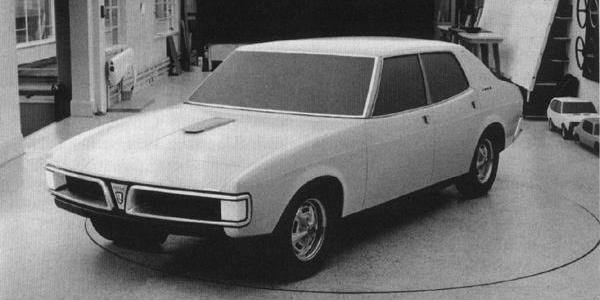 Was the Force 7V’s body engineering shared with the SD1? The opinion from Australia is that it was. This is all conjecture of course. To a degree, anyway. The Rover P8 lived as long as it did because Rover could justify its existence while the XJ was only available in cramped standard wheelbase form. And with that in mind, it is hard to believe that none of the the P8 programme found its way into the P76 – this car was so close to production, it hurt, and only the least prudent company would not have sat on what it had, and save it for a later day. N/A N/A 108.5in Front: double wishbones, coil springs. 59.4in 59.6in 111in Front: McPherson struts, coil springs. Rear: rigid axle, coil springs, radius arms V8, 4.4-litres. 59in 59in 111in Front: McPherson strut/coil springs. Rear: Rigid axle, coil springs, radius arms V8, 3.5-litres, 6-cyl, 2.3- and 2.6-litres. 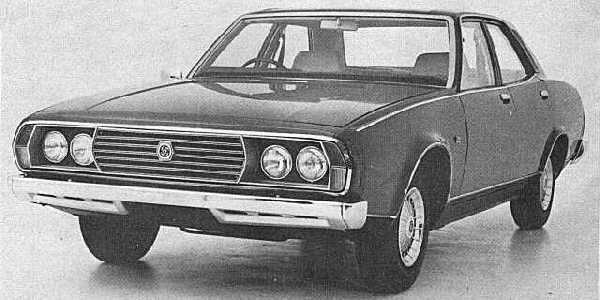 Phil West, a Leyland Australia enthusiast from Brisbane said: “Well, further to that, when I was working for a Leyland Australia dealership during the era, I once heard from ‘sources who would know’ that the P76 Force 7V hatchback did help form the basis for the hatchback design of the Rover SD1. This was more or less accepted as being fact, and it would not surprise me if this is true. The two vehicles did share some basic design similarities; McPherson front end, five-link rear coil suspension, and power rack & pinion steering. “As for development, Leyland Australia converted the then-current Holden bodies to P76 specification. The P76 running gear, power units were grafted into the Holden bodies – all of this, while the body design was still being carried out in Italy, and then later at Pressed Steel. The only transmission that would have been shared between the SD1 and P76, was the Borg Warner BW35 autobox. The manual transmission and rear axles were manufactured in Australia by Borg Warner, and were actually shared with the other Australian big car manufacturers; Holden, Ford and Chrysler. And in terms of engineering, the P76 and P8 are a distance apart, Graham still feels that there could have been structural commonality: “”Quite a lot of the monocoque structure of the P76, I reckon, could have been ‘rescued’ from tooling already completed for the P8 – or modified from the same tooling.” There is no doubt about the P76/SD1 relationship, though – and the specification table show just how spookily similar the two’s ‘hard-points’ actually are. This theory makes a lot of sense and actually answers some puzzling questions. Australian BMC/Leyland products were little more than warmed over British models with a few unique Australian features prior to the P76. However, this clean sheet car design then appeared at a time when BLMC was meant to be rationalising all products and development resources throughout the company. An additional point is that the P76 was developed on a budget of 21 million AUD, a shoestring budget even back then. The P8 and P76 were hideous, even by design standards and fashions of the day. The SD1 is, in my eyes, probably the most beautiful mass production car ever built. I agree with KeithB – The Rover SD1 is one of the most beautiful saloons ever designed and that the P8 was hardly attractive when compared to its predecessor, the ageing but majestic P5B. While I think the P8’s concept and engineering was good, the styling did leave a lot to be desired. Especially given that since the late 1920s, Rover had established a reputation for producing “timeless and elegant designs”. The P8 sadly was not one of them. David 3500 hits the mark exactly, the SD1 & P8 designs owed nothing to their makers heritage but, like the P5B before, the SD1 became the definitive Rover of its generation. The P8 could have been spawned by Rootes, Ford, Vauxhall, Toyota, Nissan……………. Hi as a current owner of a few P76s and past owner of a series 2 SD1 and having had a few apart, The P76 floor pans and Rover SD1 are completly different. The Rover has some cross member boxing after the drivers seat and has a 2 piece tailshaft and watts linkage rear suspension.The P76 has a single piece tailshaft and the fuel tanks are also in different positions. The front struts and bearing tops(rover) are re worked Triumph 2500 and the P76 has different front suspension lower control arm design,braking system. The SD1, (definitely built on the cheap with the solid disc and small drum brake design) fitted was adequate for a cortina sized car(that shared its front pads with) but definitely underpowered for a car with the high speed that the v8 offered. The Rover and P76 also share completly different stud patterns on the wheels. However a friend I worked with who has owned and wrecked many P76s(and Rovers) once set up P76 struts and a P76 rear axle on a SD1 just to get it moving around the yard and the body dimensions made this very easy to do and the track looked pretty much the same! I think the only parts they seem to share is a Force 7 hatch hinges appear to the the same as Rover. I have seen 2 out of the 10 Force 7s on the road have broken hinges issues and have seen the same thing with old SD1 wrecks. This might prove it that they share the same exact part as they brake in the same very spots. I agree that the SD1 was a more modern looking design but I went back to a P76 as I didnt like the way the car braked after a high speed run,defintely not up to the cars speed and I had many parts rebuilt and changed and the P76 was much more safer in this aspect (perhaps vitesse calipers and vented discs would of made the difference) but I was a humble 21 year old at the time! 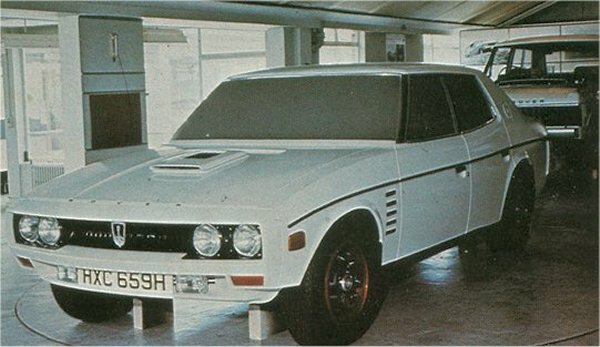 Hi all, I have seen an Australian Motoring Magazine from 1974/1975 that in the one issue has photos of the first fully complete Australian P76 Force 7 parked in front of the Longbridge plant in England – in the same issue is a photo of an heavily disguised Rover SD1 hatchback undergoing testing in England. Unless you are very familiar with the Rover SD1 and you use a trained eye you would not realize that it is actually the real SDI body dramatically hidden by add ons. This proves that the Australian Force 7 hatchback was present at Longbridge during the final stages of the Rover SD1 development. Currently – all of my library of magazines are in the possession of the Victorian P76 car club while I recover from illness , but all articles and photographs of the cars are marked and tagged so the issue wont be hard to find if no one else can already identify it. The magazine will be either a “Wheels“ (most likely) or a ”Modern Motor”. Let me know if no one can find it and I will locate it thru the Victorian Club and scan the images for you. The blue Australian Force 7 hatchback that went to England for testing actually differs in a lot of small areas to the other 9 surviving cars and became the only coupe to survive that was painted in metallic paint. I have a SD1 and a P76 in pieces in my garage right now. The SD1 and P76 have no substantial similarity in the design or construction of their body’s except for the basic concept of fixed front mudguards, front engine / rwd , McPherson strut front end. The front end design has similar basic principals but the structure and layout differs completely in design. As an example – the P76 used a “classic” forward mounted swaybar design fitted to the lower links by rubber insulated vertical arms. The P76 then has rear facing “brake reaction” rods moving from the lower link to the chassis rail. In the Rover design – the swaybar and “brake reaction” rods are incorporated into the one singular forward mounted bar. The rear suspension is completely different. The P76 V8 is clearly derived from the basic design of the Rover engine – but no parts are interchangeable. Although the cars are styled dramatically differently – they are actually very similar in basic size. I remember being told that Leyland’s approach at the time was to “charge” the Australian division for the use of any designs they used from the parent company and if this was true – such an approach would have driven the Australian designers to work with , learn and teach Rover – but not to copy any actual part of Rovers design. 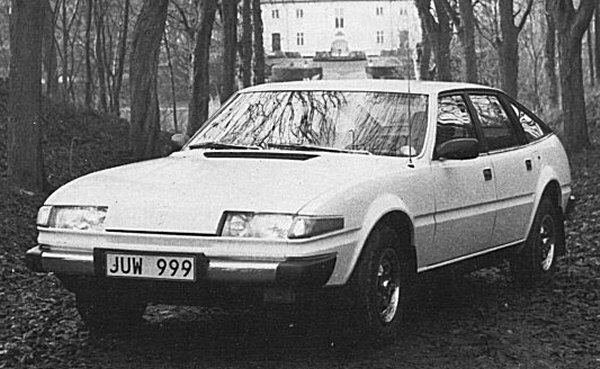 Intetrestingly the SD1 has Swedish number plates. the like. How did they manage to ruin that brand? P8. Looks like a contemporary Toyota Crown pretending to be an Alfa Montreal. If they were trying to invent “retro” they succeeded. P76. Looks like an updated 68-71 model Holden. The grill looks like the designer’s kid took the plans to kindy for a show and tell that went awry. SD1. Looks like a Ferrarri Quatroporte. Best post war (Vietnam War) British mass production car except for any Ford, two Vauxhalls and the Dolomite Sprint. Well done BLMC, all that money, all that talent, all that customer loyalty wasted through inept management.